You know, being a schoolgirl is hard enough: Acing your classes, making sure all of your extracurricular activities are totally good enough, studying for the SATS, and last but not least, being pretty, cute, and popular to boot. It’s a lot of work, and we won’t even get into the pressures of trying to get into a good college so you can start your PR career on the right foot. So needless to say, it was not okay that a bunch of gross and savage zombies invaded your sweet little suburban town and just started biting everyone without even asking them if they wanted to get bitten. There you were, just living your best teen life, and before you even knew what was happening, suddenly you were a flesh-eating zombie with a passion for fresh blood and a taste for them brains. This was, like, so not in your five year plan! 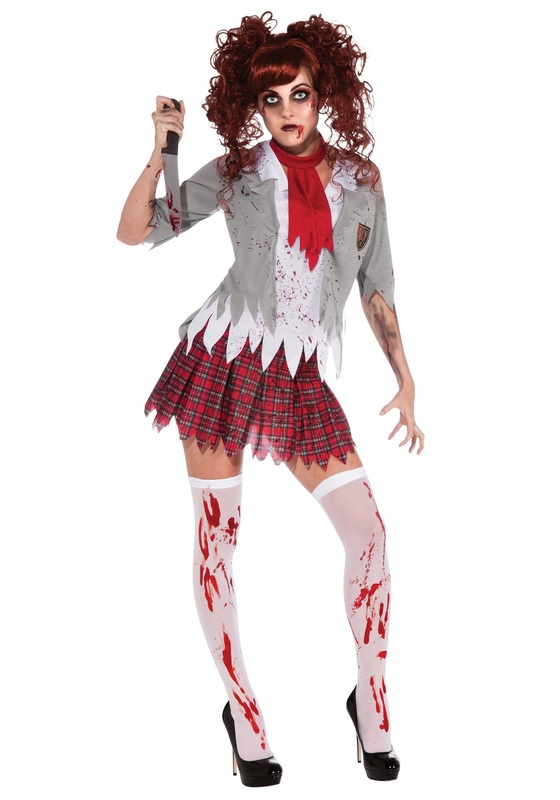 But you’re here now, so you might as well make the best of it, set yourself apart from all the other slacker zombies, and continue on with your scholastic goals in this Zombie School Girl Costume. This totally cute costume represents the new you while also making sure that you are coming correct with the regulation private school uniform. The Zombie School Girl Costume comes with a gray jacket, and the attached white shirt front has blood splatter patterning for that realistic, “I just ate some human flesh” look! The red plaid skirt has an elastic waist band for a comfortable fit, and features a jagged trim. The costume even comes with a red neck tie (with a Velcro fastener) and white stockings with bloody red stains for that “I might eat brains for fun, but I'm still cute" feel. Complete the look with a pair of polished heels and a cute up-do, and you'll be ready to eat some brains all the way to the head of the class!